Could you please be more specific about the problem you're having and give us more information so we can be able to help you? Thanks for the reply. Sorry for not being more specific, was in a hurry at the time! 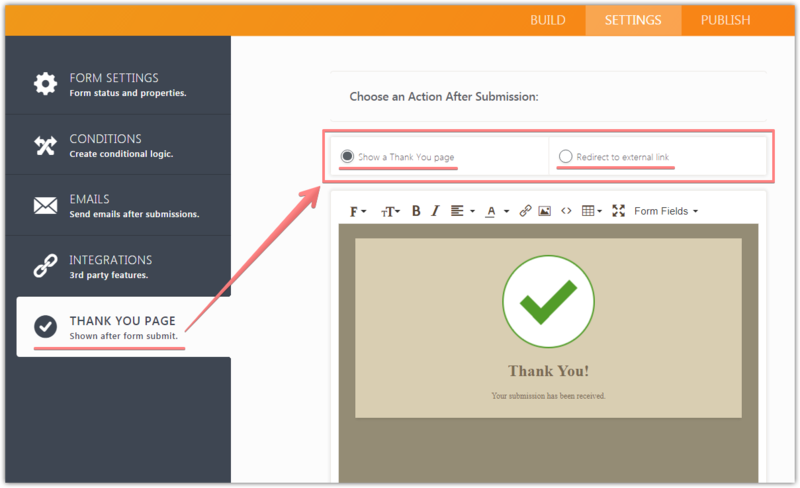 We are looking at the best way to embed/link a Jot Form into our website (using Xara Designer 12) and after the form is completed to return back to the website. We have managed to embed the form and get test responses but without seamlessly returning to original page/website. Thanks for any guidance you can offer. Please try to adjust the form Thank You Page via Settings. You may try a default 'Show a Thank You page' option or redirect to the specific webpage on your website 'Redirect to external link' to see what works best in your case.